Apple on Monday announced a new 10.5-inch iPad and a refresh of the iPad mini. The 10.5-inch iPad Air, which will sell for US$499 ($629 with cellular), provides 64 gigabytes of solid state storage and WiFi support. It has Apple’s latest mobile processor, the A12 Bionic chip, and supports Apple Pencil and the company’s smart keyboard. “The Bionic A12 is a cut above the processors used in all other tablets on the market,” Tim Bajarin, president of Campbell, California-based Creative Strategies, told TechNewsWorld. The new 7.9-inch iPad mini, which will sell at a base price of $399 with WiFi support ($529 with cellular), also has an A12 chip, as well as Apple Pencil support. A major upgrade brings Apple Pencil support, Retina display and the A12 Bionic chip to theiPad mini. The A12 boosts overall performance of the new Air by 70 percent and doubles graphics performance, according to Apple. The Air’s screen — now 20 percent larger with half a million more pixels — also has been upgraded to a 2224 x1668 pixel Retina display with True Tone technology. True Tone dynamically adjusts the screen’s white balance based on the light around it, so it’s easier to view in any conditions. The mini also benefits from the A12 chip, which delivers three times the performance of its predecessor and nine times faster graphics, according to Apple. Its Retina display is 25 percent brighter than previous models, and it has the highest pixel density of any iPad. Both units have an 8-megapixel rear-facing camera and a 7MP front-facing camera. The f/2.4 rear camera supports autofocus, panoramas, HDR for stills, exposure control, burst mode, tap to focus, timer shots, auto image stabilization and photo geotagging. It also supports 1080 HD video recording, slow motion at 120 fps, time-lapse video with image stabilization, a 3x video zoom, and video geotagging. The f/2.2 front camera supports many of the same features as the rear camera, including HDR, exposure control, and burst and timer modes. The Air and the mini are available to order online immediately, and they will be in stores next week. Both will be offered in gold, silver or space gray. “Today the iPad family takes two big leaps forward with an all-new 10.5-inch iPad Air that brings high-end size, features and performance at a breakthrough price, and a major upgrade to the 7.9-inch iPad mini, which also brings Apple Pencil, Retina display and the A12 Bionic chip to the many customers that love its compact size,” said Phil Schiller, Apple’s senior vice president of worldwide marketing. The new iPad Air is an “uptick in technology” over previous models, noted David McQueen, a research director at ABI Research, a technology advisory company headquartered in Oyster Bay, New York. “It has a larger screen, better processor, lighter weight, eSIM — all while nudging up the processing power to that of the iPad Pro, but at a markedly cheaper price than the Pro,” he told TechNewsWorld. “It has also adopted technology like the Smart Keyboard and Apple Pencil, which was initially just the preserve of the iPad Pro,” McQueen added. The 10.5-inch Air seems to be a replacement for the 10.5-inch iPad Pro, which has been discontinued. “It looks like a refresh of that previous generation of iPad Pro without including all the bells and whistles on the latest version,” said Paul Gagnon, director of technology analysis and research at IHS Markit, a research, analysis and advisory firm headquartered in London. “The focus is to hit a $500 price point. The 2018 iPad Pro was meant to be a notebook PC replacement, so the typical configuration is well over $1,000,” he told TechNewsWorld. “This is Apple’s way of maintaining some volume at a mid-range price point, especially to compete with some of the cheaper offerings that have come from Samsung and others,” Gagnon added. 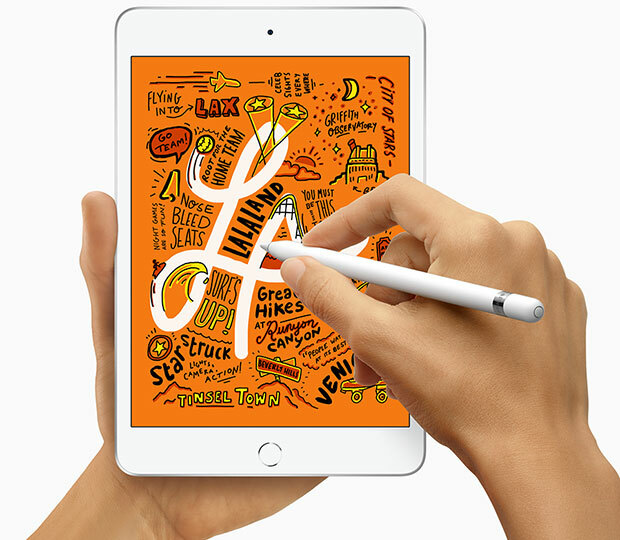 Apple appears to be focusing the iPad on creative work, like note-taking and sketching, observed San Jose, California-based Kevin Krewell, principal analyst at Tirias Research, a high-tech research and advisory firm. Although the rationale behind the Air refresh seemed apparent, the upgrade of the mini puzzled some analysts. “I don’t quite get the point of it,” Gagnon said. “At $400 for an 8-inch tablet, it is much more expensive than the typical small tablet, which is usually in the $100 to $200 range,” he pointed out. Worldwide shipments of tablets in the 7- to 9-inch category dropped from 84 million units in 2017 to fewer than 60 million units in 2018, he noted. The same is true for the tablet market, generally, with worldwide shipments slipping from 176 million units in 2017 to just over 140 million in 2018. The mini refresh also seemed puzzling to Lauren Guenveur, a senior research analyst at IDC, a market research company based in Framingham, Massachusetts. “I heard rumors of the launch of a new iPad mini for many months before today, and for the life of me, I couldn’t figure out why they would bring back a small screen tablet when they have a smartphone with a screen that approaches the same size as the iPad mini,” she told TechNewsWorld. That said, Guenveur’s anecdotal experience suggests there may be some potential for the new mini. “I do a lot traveling for work, and I do consistently see the iPad mini being the tablet that most teenagers and children have for media consumption,” she observed. “The mini seems to be for either technology laggards, or for those who need a device purely for consuming media,” Guenveur added. Although the tablet market is generally in decline, Apple has been able to buck the trend, for the most part. It may continue to do so with its latest iPads.